Handheld vacuum cleaners are ideal for quickly dealing with spills, or giving a swift refresh to your upholstery. They will also get into those hard-to-reach areas, along the skirting, under the sofa, and are great for giving your mattress and curtains the once-over. Using a standard upright vacuum on stairs can be tricky – even cordless vacuums are often too large to pick up well on the narrow surfaces of stairs, and that's before you even get to the question of how to vacuum the carpet on the vertical front of each step, or how you're going to get between the bannisters. That's where a handheld vacuum cleaner really comes into its own, giving you manoeuvrability, reach, and suction power. Take Your Carpet to the Cleaners! When you're looking for a handheld cleaner, make sure you get one that can handle carpet, not just upholstery. Handheld carpet cleaners can also clean upholstery, but handheld upholstery cleaners can't always handle carpets. Bear in mind that a handheld vacuum will typically only have up to 15 minutes continuous use – the smaller an appliance is, the more power it needs to achieve the desired end result. While a handheld carpet cleaner won't replace your bulky upright (as the housework would end up taking all day, and no one wants that) they're great for a quick freshen-up between the weekly full clean. What Am I Looking For From a Handheld Carpet Cleaner? Suction power – it's no good spending money on a vacuum that only picks up as much dirt as your dustpan and brush. Lightweight – the point of handheld carpet cleaners is that they're easy to carry from room to room, up stairs, and into hard-to-reach spaces. Shorter charging times – saves your electricity bill! Longer battery life – the closer you can get to 15 minutes (which should be long enough to thoroughly do a large room), the better. What kind of floors do you have in your home? If you have both carpet and hard flooring (for example, tiling in the kitchen and bathroom), you will need to buy a handheld cleaner with multi-surface capability. Even if you have carpet throughout, multi-surface capability is useful, as you can quickly and easily vacuum up crumbs from work surfaces. How easy do you find it to bend over, crouch down, etc? You'll be doing a lot of bending and crouching with a handheld vacuum, because of its small size. Do you have pets? If so, make sure the handheld vacuum you buy can handle pet hair. The Vax Gator has an easy-empty, flip-open mouth, so disposing of dust at the end of your cleaning run is a breeze. The filter is removable, and can be washed in warm, soapy water, and allowed to dry in its own time. Vax provides a UK-based, 7-day customer service helpline, and the Gator comes with an instruction manual, and in what Vax claims is “certified frustration proof packaging” - though they don't say that they'll refund you if the packaging does frustrate you. 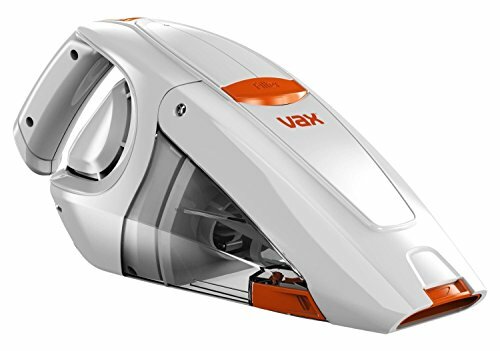 The Vax Gator has a very short battery life (under seven minutes), and struggles with thick carpet. It doesn't have the necessary suction required to cope with pet hair. Overall, the Gator would probably work best for cleaning rugs and upholstery, and picking up light spills on thinner carpet. 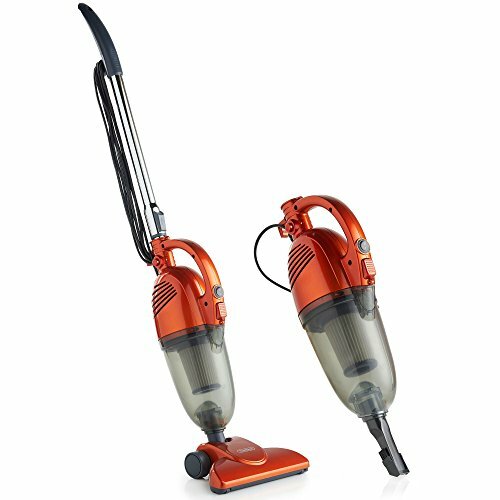 This would be a moderately priced vacuum for someone without pets to keep for those quick clean ups, or to use in the car. It could also work well for ensuring mattresses and curtains remain hygienically clean. There are cheaper handheld cleaners which offer better functionality, although the Gator isn't overly pricey. This is a combination cleaner, allowing you to switch between an upright stick vacuum, which saves your back if you're doing large areas, and a handheld cleaner for those hard-to-reach places. Suitable for cleaning up both dry and liquid messes and spills, the VonHaus has multi-surface functionality. However, it does seem to perform best on sealed hard floors, such as wood and laminate, and isn't really suitable for use on vinyl. All switches are mounted on the handle, which is ideal for those who find it uncomfortable to bend down, or who don't want to be peering all around the vacuum to turn it on and off. 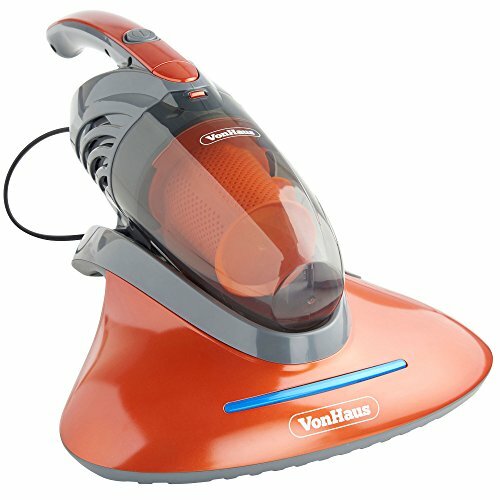 The VonHaus is a bagless vacuum, and comes with a hypo-allergenic HEPA filter and sponge filter, to help reduce allergen particles in the home. Its one major flaw is that it is prone to overheating. This would be a suitable handheld vacuum for people whose flooring is predominantly wood or laminate, with rugs, and who need to ensure their home is as dust and allergen-free as possible. Parents of children with asthma, for example, may feel this is a good choice for interim cleaning when there isn't the time to do a main clean. A very reasonably priced vacuum, however there are others at the same price that are better at handling carpet, if the HEPA filter isn't essential for you. However, if you have people in your family who are very sensitive to dust and airborne allergens, the HEPA filter makes this the logical choice for a handheld cleaner. Also from VonHaus, this is a straightforward handheld cleaner, which has genuine multi-surface functionality, with no problems noted on vinyl or thicker carpets. It comes with a range of accessories, and an easy-empty dust compartment, and can handle dry and liquid spills with ease. With twelve minutes of continuous use from one charge, you can easily do an entire room with this little guy. It is worth checking and tightening the seal – it can be less than fully airtight, which does result in a loss of suction. This cleaner would suit those with a mix of carpets and hard flooring who aren't overly bothered about having a HEPA filter on their handheld vacuum. A good basic handheld carpet cleaner at a good price. A high-tech offering from VonHaus, this vacuum cleaner includes UV action, which destroys the exoskeletons of little nasties like bed bugs and dust mites, not only killing them, but ensuring they don't get a chance to reproduce, as their eggs will be completely destroyed by the UV lamp. This cleaner vibrates as it cleans, loosening ingrained dirt and killing 99.9% of bacteria – this is basically Dettol that you can plug into the mains, without the lingering hospital ward smell. The cleaner comes with a HEPA filter, for hypo-allergenic cleaning, and an upholstery and crevice tool attachment. The filter is removable and washable. It does have a fairly small dust container, meaning it needs emptying quite frequently, and it could do with a larger brush, in order to be more efficient on room-sized areas and mattresses. UV lamp penetration to completely destroy bed bugs, dust mites, fleas, and their eggs and larvae. This is ideal for pet owners, especially those with more than one pet, or long-haired breeds, who want to be sure their home is not just clean, but completely healthy. For the technology and cleaning action you get with this vacuum cleaner, you might expect to pay more than you do. Definitely a worthwhile investment if you want to keep your pets and enjoy a completely clean home, with the peace of mind of knowing there's no little nasties lurking in your carpets and bedding. This handheld cleaner comes with two-step filtration, for extended filter life, and provides 15minutes of continuous cleaning from a five-hour charge. 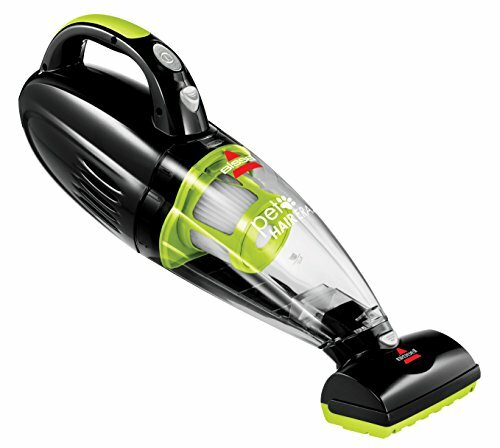 This is a powerful yet compact handheld vacuum cleaner, which deals admirably with pet hair, and is easy to store. Some people might find the fact that it's only available in lime green a little off-putting, but at least it should be easy to spot in even the most crowded home! 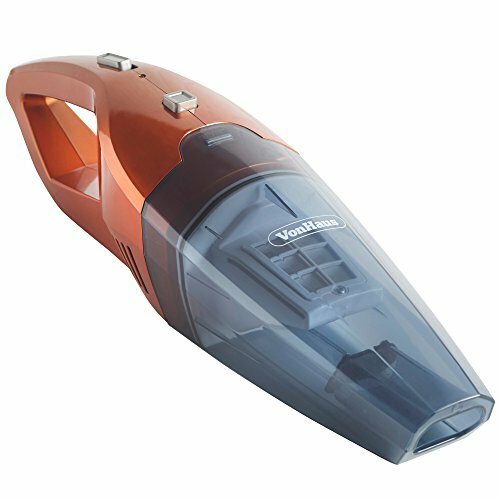 This is an ideal handheld vacuum for those who don't need the hi-tech options of the VonHaus UV, but still want to ensure that having pets doesn't mean they end up with grubby carpets and upholstery. This is a good general-purpose handheld cleaner at a reasonable price, with no real drawbacks as far as functionality is concerned. Numatic's George promises to be ‘all in one’ for use in wet and dry situations - read our review to find out if that's true. If you’re looking for multiple uses in one investment, read our review of this Vax 3-in-1 cleaner. Is it worth the money?